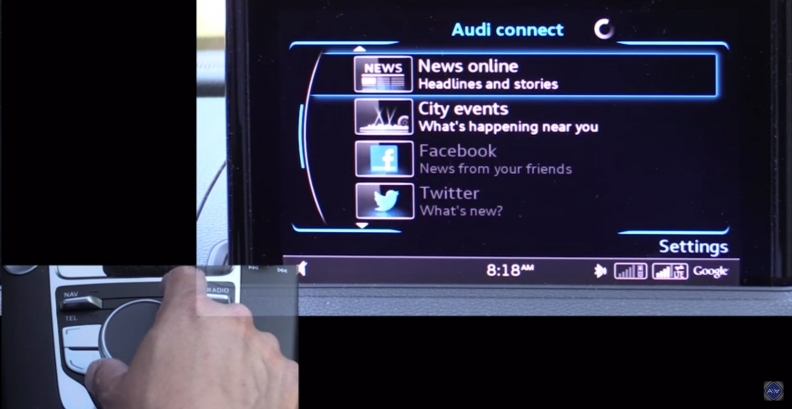 Audi's MMI system allows drivers to check their Facebook and Twitter messages. SAN FRANCISCO (Reuters) -- When it comes to dashboard displays that are more like smartphones, two things are clear: Customers want them, and automakers are intent on supplying them. Automakers say outsized dashboard displays that behave more like smartphones will boost revenue and attract buyers. And they also insist the new screens will make driving less dangerous, because of well-integrated voice controls and large touchscreens that will keep drivers from fumbling with more dangerous mobile phones. "I think they [the screens] raise serious public safety questions," said Joe Simitian, the former California lawmaker who spearheaded the state's laws on phone use while driving. "This is going to be something legislators struggle with for years to come." "You can't be looking at a screen and be looking at the road at the same time," said David Strayer, a professor of cognition and neural science at the University of Utah, who has written several studies on distracted driving. The screens "are enabling activities that take your eyes off the road for longer than most safety advocates would say is safe." His research shows that reading the average text message -- a function some of the screens support -- takes 4 seconds, far longer than what he considers safe. In an Audi A3, for example, drivers who sync their phones with their cars can check for mentions of themselves on Twitter and see those tweets on their dashboards-although not their full Twitter streams. They can upload photos taken on smartphones and request mapping to the place the photo was taken. Text messages pop up on the dashboard, in addition to being read out loud. "If you don't provide something that is useful, people will just use their smartphones, and we all know that's the biggest driver distraction there is," said Mark Dahncke, a spokesman for Audi. Up to now, dashboard technology hasn't factored highly into most car buying decisions, but carmakers expect it to become increasingly important over the next three to five years. The National Highway Traffic Safety Administration has issued driver-distraction guidelines for dashboard displays in moving cars. They advise against displays that include photographs or moving images unrelated to driving, and suggest that drivers shouldn't need to tap a button or key more than six times to complete a task. But so far, the guidelines are voluntary, with automakers under no obligation to comply. The auto industry has issued voluntary guidelines of its own. But in many cases, industry standards fall short of the government's. For example, the industry guidelines say that drivers should be able to complete tasks on the displays in a series of single glances that generally take no more than 2 seconds each, for a total of 20 seconds. But the government guidelines advise that drivers should be able to complete tasks in a series of 1.5- or 2-second glances, for a total of no more than 12 seconds. "It should be set up so people can do it in just four glances," says Henry Jasny, vice president of the Advocates for Highway and Auto Safety, a Washington-based group funded by insurers and others. His group has asked for the government guidelines to become law, figuring that even imperfect mandatory rules would be better than no requirements, and that during the rulemaking process, the organization can fight for more stringent regulation. Some, such as Hyundai, are simply making their displays compatible with Android and iOS, the smartphone software from Google and Apple, so drivers can see a bare-bones version of their phone on the screen. Other companies, including Tesla, are creating elaborate systems that don't rely on syncing with phones, but replicate many of the things consumers might use their phones to do, such as checking for nearby restaurants. "What we're doing is developing graphics that are intuitive, so you can gesture or swipe or zoom," he said. "Something that responds like that, and is big, is much safer than a smartphone." So far, insurers haven't taken a stand on the new souped-up displays. A large, interactive display on the dashboard would neither increase nor decrease policy rates, said a spokeswoman for the Insurance Information Institute, unless it was considered valuable enough to increase the risk of theft.